What happened to all that marijuana money? Possibly THE most asked question about school funding. We’ve answered it many times but the question still exists, so let’s make sure we get the information out there! It’s really not much of a mystery; but it does seem to have a lot of folks confused. SJK is sharing some information and resources to help “solve the mystery”. 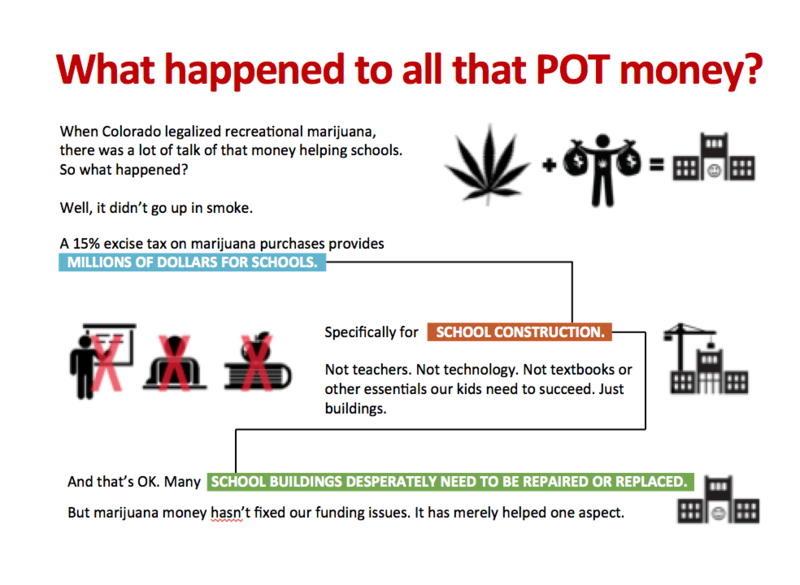 In November of 2012, when Colorado voters approved Amendment 64 (the legalized sale of marijuana for recreational use and the subsequent 15% excise tax) they thought they were solving the state’s problem of funding our public schools. Not so. While there are funds from the “Marijuana Tax” that goes toward funding schools, the devil is in the details. The funds directed to schools are limited to the first $40 million, and are directed into a “state fund used for constructing public schools”. No funds for operating expenses, construction only. But there’s more. The statewide vote to approve the tax (referred to in Am. 64) was not passed by voters until 2013 – Proposition AA. The 15% excise tax on Marijuana is only partially directed to schools – the first $40 Million. Funds exceeding that amount are directed to support the regulation of the sale of marijuana as well as educational programs regarding the use of marijuana, etc. This $40 Million are designated for the “state fund used for constructing public schools”, the BEST program: Building Excellent Schools Today. The $40 Million is intended for construction ONLY, is a matching grant, and provides no funding for operating expenses. So then, why can’t our school district use some of the $40 Million for our repairs and new buildings? $40 million funding for a statewide program does not go very far when there are 178 school districts in the state; especially if you look at the cost of building one school, which depending on the size, location, and various other considerations of construction, can range anywhere from $10 or $15 Million for some extremely small elementary schools to $45 Million plus for a high school. The BEST program has other limitations and was intended for some specific uses. BEST, Building Excellent Schools Today, is a fund that was established in 2008. It is grant based and requires matching funds. The key focus of BEST (in 2008) was directed toward those poorer, small, and rural school districts that simply do not have the tax-base of the city and suburban school districts to support a bond large enough to do major construction. Most schools in the metro area run anywhere from $10, $15, and $25 million-plus; a small district like Creede, Haxtun, Kim and many others can’t come close to that. DENVER – The Colorado State Board of Education on Wednesday approved $447 million for 35 school construction projects across Colorado from the Capital Construction Assistance Fund for the Building Excellent Schools Today (BEST) grant program. The 2018-19 award is the largest ever amount approved for the program that began in 2008. Approximately $85 million of the 2018 awards will be funded through cash grants provided by income earned from the Colorado State Land Board, marijuana excise taxes, spillover from the Colorado Lottery and interest on the assistance fund. Applicants will contribute $74 million in matching funds. Another $190 million is through lease-purchase grants from the state. Financing will be repaid with future assistance fund revenues. Applicants will contribute $98 million in matching money. School districts, BOCES, the Charter School Institute, charter schools and Colorado School for the Deaf and the Blind may apply for the competitive grants. The grants are intended for the improvement of health, safety, security and technology in public schools. Schools apply for the grants and the Capital Construction Advisory Board reviews applications, prioritizing them and submitting their recommendations to the state board for approval. Replacement of a junior-senior high school and renovation of an elementary school in Hayden RE-1 School District, $61.2 million. Renovation and replacement of the Buena Vista High School and Middle School in Buena Vista R-31 School District, $50.9 million. Replacement of Orchard Mesa Middle School in Mesa County Valley 51 School District, $39.9 million. New preschool through 12th grade school in Kit Carson R-1 School District, $32.3 million. A new school for Swallows Charter Academy, $20.1 million.